Rachel Shenton is best known for playing Mitzeee on Channel 4's soap, Hollyoaks. Having made a splash on our screens playing Mitzeee in 2010, Rachel has become a much loved character playing a huge role in many of their leading storylines. Before taking up the role, Rachel led the way playing a part in a web TV series 'Sofia's Diary' and filmed a leading role in a new vampire web drama, Blood and Bone China. 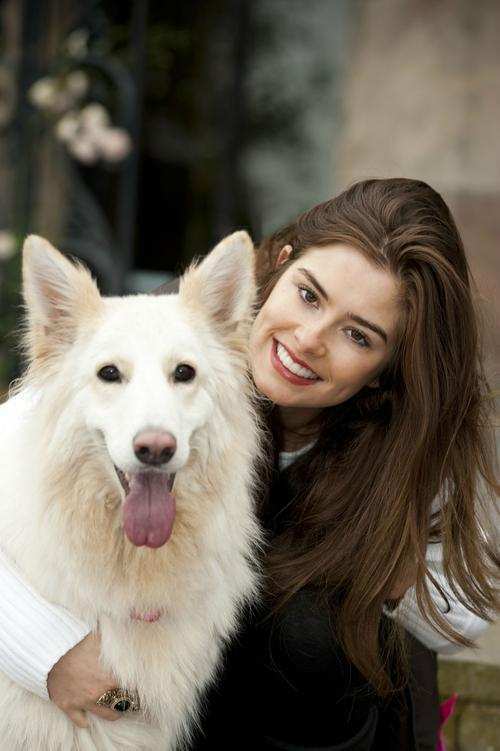 Kim O'Meara caught up with Rachel to find out about her love of Mitzeee, acting and growing up with dogs. Well, I have a long-haired white German Shepherd called Cassie, she's a 4 year old girl. She's a rescue dog. We adopted her when she was 6 months old from a German Shepherd rescue. She'd been neglected and very bady treated, she was a real bag of nerves when we first brought her home and it took some getting used to knowing how to handle to make her feel at home. She was so scared of any noise - the hairdryer, doors closing – anything really. It took about 18 months before she got back on track. It's only in the past few months she's started to bark – before that she didn't make a sound. It's so funny, normally we'd have told our other dogs 'Shut up, it's only the postman' but when she first barked we were all smiling that she'd found her voice. She's still very much a baby though, I think we've mollycoddled her because of what she went through before we adopted her, and in trying to get her to come out of her shell. We've always had German Shepherds, there's lots of pictures of me as a child growing up with our family dogs. They were always black and tan German Shepherds, Cassie is our first white GSD. We've never been without a dog and when we decided to get another we went to a breed rescue and asked them to let us know when they had a dog under a year old in their care. They knew we had breed experience and told us about Cassie. I was working so my mum went to meet her and said she couldn't leave her, so that was it! Being long-haired she's always been very fluffy, erratic – but fluffy! She's great, we wouldn't be without her. You've been playing Mitzeee on our screens since 2010 in Hollyoaks, what do you love most about the character you play and did you think when you first started she would grow and be involved in as many of the major storylines as she has? I really love playing Mitzeee. She's great, she does and says things people want to say, but daren't. She wears her heart on her sleeve and you have to give her credit for that. And finally, this is always a tough question and often requires a fair degree of thinking time but….If Cassie had the ability to speak and answer one question and one question only, what would you ask him and what do you think that he would say? I'd ask her if she loved me and I think she'd say 'yes'. And last but not least, Tony Blake/Flat One Photography & Rookery Hall Hotel & Spa in Nantwich, Cheshire for hosting us!